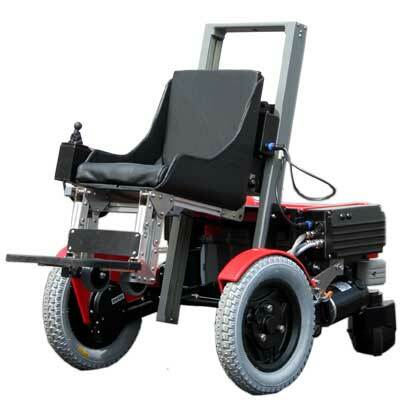 Each machine is configured for an individual and the seat size will vary considerably between clients. Please refer to notes 1-6 & 8 at the bottom of this page. Measurements of the actual machine being used must be made where size is critical to an environment. Maximum width: 608mm / 23.9"
Tracking width: 560mm / 22.0"
Max chassis length: 799mm / 31.5"
Typical turning circle1 high2: 980mm / 38.6"
Typical turning circle1 high2: 650mm / 25.6"
Typical max length3 high2: 1060mm / 41.7"
Typical max length3 low4: 1200mm / 47.2"
Typical max height5 (excl seat): 1066mm / 42"
Each seat is custom made to suit individual needs so there are hardly any set constraints. If you would like to know more please contact us to talk about your requirements. 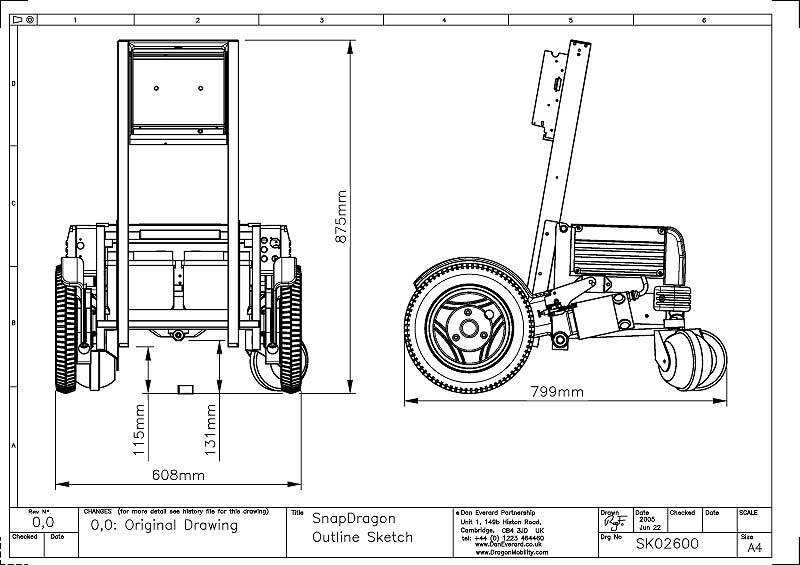 Typical seat base elevation8 from ground to approx 600mm / 23.6"
Max external seat width: 440mm / 17.3"
[*]Dragonmobility Ltd has a policy of continuous development of its products, and reserves the right to change any or all aspects of the above specification without prior notice. Turning circle is used here to mean the space needed to spin through 360 degrees, with about a 20kg user in a typical seat. High means here that the footrest is near vertical, i.e. the footrest wheels are above the ground. Maximum length depends on the particular seat and footrest dimensions. Length given is only an illustration, estimating for about a 20kg user. Low means here that the footrest is near horizontal, ie the seat is as low as possible. Maximum height depends on the particular elevator column and tilt angle. This in turn is dependent on user weight vs stability and is set individually. Weight depends on the particular elevator length and seat: its size, seating system used, complexity, etc. Precise range will depend on user weight, type of terrain etc. N.B. Range and life of batteries will improve significantly if the batteries are charged often, even for short periods during the day, as well as overnight. The elevation will depend on the seating system used, height of the elevator column and tilt, according to the weight and choice of the user.